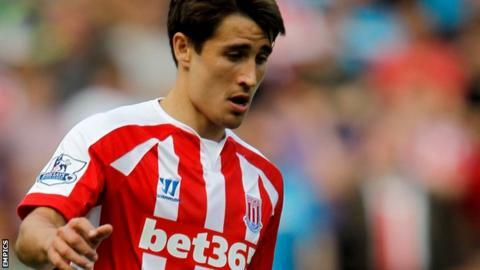 Stoke City assistant manager Mark Bowen says getting Bojan back ahead of schedule is a massive pre-season boost. The ex-Barcelona striker, 24, missed the second half of last season with an anterior cruciate ligament injury. But he has been named in Stoke's squad for Saturday's friendly at Brentford and is on course to be fit for the start of the Premier League season. "You're desperate to get him back but you have to be mindful of what he's been through," said Bowen. "He may play a part against Brentford and it'll be great to have him back, but it has be tempered with a bit of caution." Stoke City start the Premier League season on 9 August with a home game against Liverpool, who they beat 6-1 on the final day of last season. The Potters could have three former Reds players lining up against their old club that day - Peter Crouch, Charlie Adam and Glen Johnson. Bowen told BBC Radio Stoke: "He's way ahead of schedule. The physios keeps putting the reins on him as he just wants to do more, but it may take time to build up his fitness. "Look at Peter Odemwingie last season. He was out seven or eight months with his recovery from a similar knee injury. Bojan has been out for five and a half months, maybe six, and and we don't want to rush him and put too much pressure on him to finish off what he did last year." The Potters, who enjoyed their most successful Premier League season in 2014-15 by finishing ninth with 54 points, have made seven summer signings. Boss Mark Hughes has added goalkeepers Shay Given and Jakob Haugaard, defenders Glen Johnson and Philipp Wollscheid, midfielder Marco van Ginkel, winger Moha El Ouriachi and striker Joselu.